This article is about the Dark City and the World That Never Was as a whole. For the castle above the world, see Castle That Never Was. 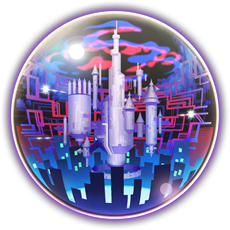 The World That Never Was is a world featured in Kingdom Hearts II, Kingdom Hearts 358/2 Days, and Kingdom Hearts 3D: Dream Drop Distance. The world of Organization XIII, it is home to a seemingly endless supply of Heartless and Nobodies. The Heartless seem to spawn more here due to how close The World That Never Was is to the darkness of Kingdom Hearts. The Organization controls the world from the Castle That Never Was, a massive fortress that floats weightlessly over the expansive Dark City. The Alley to Between (狭間につながる路地, Hazama ni Tsunagaru Roji?) hides a portal to Betwixt and Between. Sora, Donald, Goofy, and King Mickey used this portal to get into the world, thanks to Axel's sacrifice. The alley way connects to the main route that leads to the Castle That Never Was. The first Save Point of the world can be found here. Exiting the alley leads to the Fragment Crossing (断片を紡ぐ道, Danpen o Tsumugu Michi?, lit. "Fragment-Spinning Road"), a long series of winding streets that lead to Memory's Skyscraper. It is full of neon signs attached to vacant buildings as well as a power plant which seems to power some or all of the city. Many Shadow Heartless are here, but in Kingdom Hearts II Final Mix, they are eventually replaced with Nobodies. Sora, Donald, Goofy, and King Mickey took this route on their way to the Castle That Never Was. Pluto also had an encounter with Axel here. Following the Fragment Crossing is Memory's Skyscraper (記憶の摩天楼, Kioku no Matenrō? ), an imposingly tall building that presides over Dark City, in a plaza near the cliffs surrounding the Castle That Never Was. At its feet lies a plaza staircase leading to glass doors, and on its face is a massive television screen, which displays memories of those nearby in Another side, Another story.... In the corner of the plaza is a wrecked truck, flipped on its side. During his battle with Xemnas, Sora was pulled into an area that included Memory's Skyscraper, called Memory's Contortion, in a battle similar to the one Roxas and Riku had. In Dream Drop Distance, Memory's Skyscraper is accessible only for Riku. However, this is where Sora first landed when he dived into this world before being put to sleep. The left road behind Memory's Skyscraper leads to the Brink of Despair (絶望を望む断崖, Zetsubō o Nozomu Dangai?, lit. "Cliff Overlooking Despair"), a cliff with a clear view of the hovering Castle That Never Was. Sora, Donald, Goofy, and King Mickey arrive here and access the castle via a path using the Keyblade. It has the second Save Point of this world in Kingdom Hearts II. The Castle That Never Was (存在しなかった城, Sonzai Shinakatta Shiro?) is an enormous white castle that floats above the city, dominating its skyline. It is decorated all over with Nobody symbols. It serves as Organization XIII's main base of operations. Sora and the others standing in the door leading to The World of Nothing. After Xemnas's first defeat within Memory's Contortion, he flees into his Kingdom Hearts. However, a door appears that leads Sora and his friends within that Kingdom Hearts to an area named "The World of Nothing". 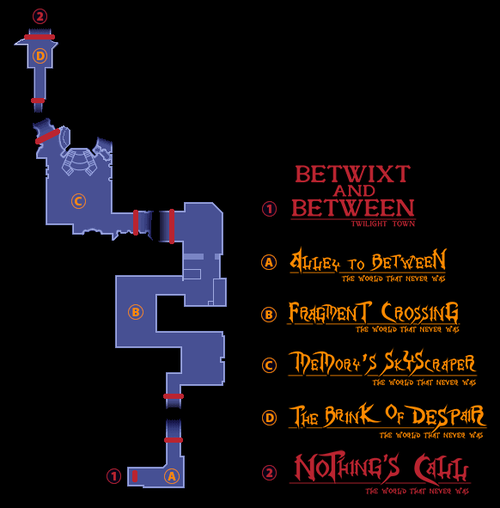 The first area inside the door is The World of Nothing—End's Beginning, a passageway resembling the Dark City where skyscrapers suddenly erupt from the ground in order to repel Sora. A strange black-and-white tunnel leads from this room to a platform looking out on the gigantic Nobody that Xemnas is riding. From there, Sora can climb falling skyscrapers to walkways surrounding the lower cannons of the Nobody, The World of Nothing—Twin Cannons. Once he destroys those, Sora swings his way up to the ship's Energy Core, which is kept in a room appropriately named The World of Nothing—Energy Core. After disabling the ship's energy core, he makes it up The World of Nothing—Xemnas's Throne Room, where Xemnas sits in his Keyblade Armor, enthroned atop the dragon Nobody's head in a chamber equipped with the weapons of the defeated Organization members. After completely destroying the gigantic Nobody, Sora and Riku are left in The World of Nothing (虚無の世界, Kyomu no Sekai? ), a nearly-empty void of shifting greys and whites where Xemnas makes his last attempt to destroy them. He fails, however, and the boys are deposited at the Dark Margin. In Kingdom Hearts 3D: Dream Drop Distance, only Memory's Skyscraper, the Brink of Despair, and the real Castle That Never Was are visited in the realm between. Sora visits a dream of a dream of the Dark City of The World that Never Was, which appears more contorted and ethereal than the city initially appeared in Kingdom Hearts II, similar to the World of Nothing within Kingdom Hearts, while Riku visits a dream of a dream of the Castle That Never Was. Whether or not the locations they visit exist in the real world version of the world is not yet known. The Avenue to Dreams (夢境の街路, Yumesakai no Gairo?) is a large urban area beginning with an enclosed alley featuring a save point and a Moogle hologram. Up a long flight of stairs lies a piece of destroyed building, blocking the path into the city that must be scaled to advance. Beyond is an area of twisting alleys surrounded by skyscrapers that can be scaled with Flowmotion. Several buildings are adorned in blue stripes with a geometric pattern and when stood upon, they rapidly elevate, throwing Sora into the air. Another building has similar white stripes and can be destroyed by using a Reality Shift. Perhaps the most notable feature of this area is a stream of blue-green mist that falls from the roof of a massive tower extremely similar to Memory's Skyscraper and flows through the streets. Beyond this tower, the pavement is revealed to be floating and broken, away from the rest of the city and leads off into a more urban area. The Avenue to Dreams directly leads to the Contorted City (歪みに満ちた町, Yugami ni Michita Machi? ), which seems to emerge from a canyon of strange blue-green rock. This area does not have a save point. Much of the architecture here is coated in blue-green mist. Many buildings float of their own accord, attached to chunks of rock separate from the road, and several shake and swing. The blue markings appear again on the shaking section that is able to launch Sora skyward. Beyond several overturned buildings, a path of broken pavement and destroyed buildings forms an upward spiral. Neon strips and signs on the buildings can be traversed with Flowmotion. In several places, floating buildings marked with red symbols will hurtle toward Sora and must be destroyed with a Reality Shift or they will cause damage. The Nightmarish Abyss (凶夢の深淵, Kyōyume no Shin'en?) features a large open plaza surrounded on three sides by skyscrapers, with a crashed truck (identical to the one near Memory's Skyscraper) blocking access to a side-street. 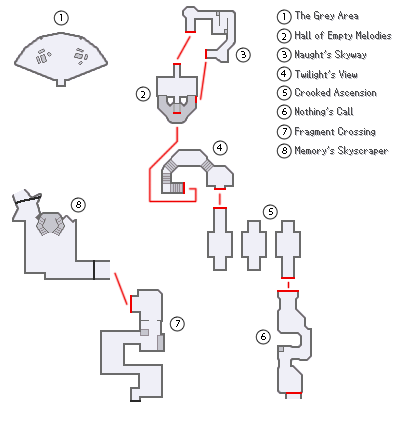 The fourth side drops off to an abyss that is spanned by floating skyscrapers laid on their sides, forming a mostly straight path between two cliff faces and leading toward what appears to be Memory's Skyscraper and the Castle That Never Was. Several neon strips appear here that can be traversed through Flowmotion, as in the Contorted City area. Darkness's Call (闇への誘い, Yami e no Sasoi?) is an arena-shaped area with a spiraling violet vortex below. Streams of darkness rise around the central area. This is where Riku fights Ansem, Seeker of Darkness the first time during his Mark of Mastery exam. A platform may appear in the area if Riku uses Reality Shift on Ansem. Darkest End (闇の果て, Yami no Hate?) is a long arena that has huge dark pillars that resemble the ones found in the Realm of Darkness and a violet spiral in front of the place. In the back, there is a bottomless abyss. This is the place where Riku fights Ansem, Seeker of Darkness in his second form. When Roxas abandons the Organization, he wanders for a short time through the streets of the Dark City. Here, outside one of the many locked stores, Roxas meets Axel, who tries to stop him from leaving, warning that the Organization would destroy him. Roxas leaves a saddened Axel behind, and continues along the streets to Memory's Skyscraper. After defeating Xion, Roxas returns to the city, hoping to engage Xemnas and the other Organization XIII members. Instead, he discovers multitudes of Heartless, sent to attack the Keyblade master. Roxas fends off the hordes of Neoshadow Heartless, but is ultimately outnumbered. Riku appears from atop a skyscraper, and assists Roxas in slaying the Heartless using Roxas's Oblivion Keyblade. The two then turn on each other. Roxas nearly defeats Riku, who had not yet mastered himself or control of the Keyblade. In desperation, Riku releases the darkness in his heart, assuming the form of Ansem, Seeker of Darkness, with his guardian, and subdues Roxas. DiZ promptly arrives to find Riku-Ansem with his hood up. The two take Roxas back to their secret base in Twilight Town. Sora arrives in the Dark City, with the help of the Organization's traitor, Axel. 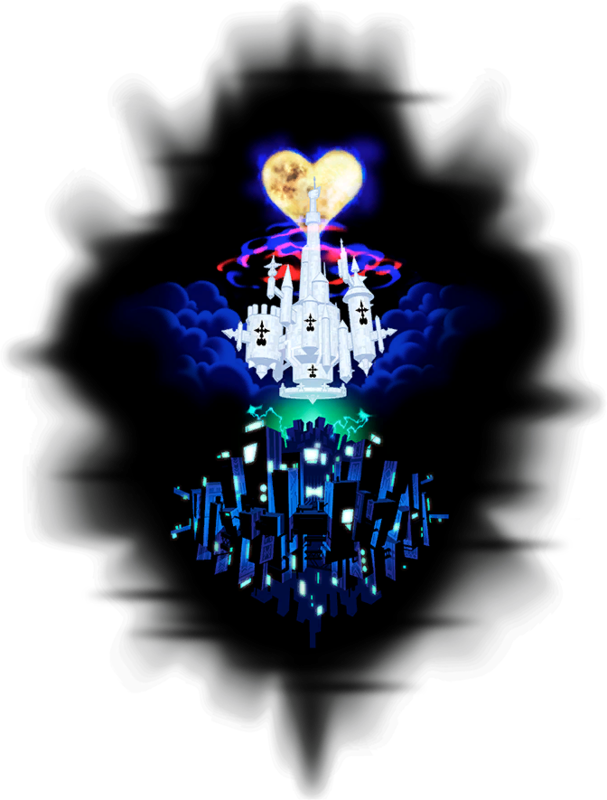 Fighting their way through large numbers of Heartless, Sora, Donald, Goofy, and King Mickey reach the center of the city, Memory's Skyscraper. Here, Samurai Nobodies materialize in front of Goofy and Donald. Roxas then appears, challenging Sora to a fight. The two disappear to duel on the Dive to the Heart. Sora defeats Roxas, who departs, calling Sora "a good other." The group then continues on to the Castle That Never Was. They ascend through the many levels of the castle, meeting up with Riku and Kairi, and finishing off the remaining members of the Organization. After the group runs into Ansem the Wise on one of the upper floors of the castle, he sacrifices his life in an attempt to destroy Xemnas's Kingdom Hearts, the blast returning Riku to his original form. The group make their way to the top floor, where they confront and defeat Xemnas, leader of Organization XIII. During the extensive final battle with Xemnas, much of the Dark City and the Castle That Never Was is destroyed. Chunks of building are ripped up and thrown at Sora and Riku, and the main tower collapses off the castle. What ultimately happens to The World That Never Was following Xemnas's defeat remains unknown. After Sora and Riku successfully unlock all seven sleeping Keyholes, Sora arrives at The World That Never Was, where he is then greeted by Xigbar. Xigbar explains that the Real Organization XIII has been guiding the still-sleeping Sora through the Sleeping Worlds to The World That Never Was since his exam began, and that the Robed Figure was present the night when Destiny Islands was swallowed by darkness in order to be there when Sora entered the Sleeping Worlds. Xigbar then puts Sora into a second sleep. Meanwhile, Riku arrives in the Castle That Never Was, wondering why he has not awoken yet with the exam supposed to be over. He travels through the castle to find Sora trapped in a sphere of darkness. Riku tries to awaken Sora, but the darkness around the sphere turns into the Anti Black Coat Nightmare, who Riku engages and defeats in battle. Riku is then swallowed by darkness and confronted by Ansem before he gets a chance to wake Sora. The still-dreaming Sora sees illusions of Kairi, Riku, Aqua, and Terra, while Sora takes on Ventus's appearance. Upon the dream's end, Sora asks Xigbar whether everything he had seen was implanted by the Organization. Xigbar clarifies that the visions were a dream, as it was impossible for the Organization to insert false memories and visions into his head. Xigbar then leaves Sora to battle with Xemnas, whom Sora defeats. Sora proceeds to collapse from exhaustion, and is then consumed in darkness. Young Xehanort appears and reveals his plan to turn Sora into the thirteenth member of the true Organization. Sora falls unconscious shortly after and is then taken to Where Nothing Gathers. Riku ultimately prevails against Ansem and travels to Where Nothing Gathers, where Riku finds the unconscious Sora. The cloaked members of the True Organization XIII materialize on the thrones, and Young Xehanort prepares himself to become Master Xehanort. King Mickey interrupts and freezes the group with Stopza, but Young Xehanort recovers and knocks him away, and summons a Keyblade to battle Riku. Riku defeats Young Xehanort just as Mickey's spell breaks, and Master Xehanort reforms. Master Xehanort announces his plans to create the χ-blade again, after his experiment with Ventus and Vanitas proved a failure. Master Xehanort then prepares to turn Sora into his final vessel as Xemnas and Ansem restrain Riku and Mickey. However, Lea arrives and protects Sora from Xehanort's attack. Riku, Mickey, and Lea escape from The World That Never Was with the timely aid of Donald and Goofy. The members of the Organization then fade into darkness and return to their proper places in time. Note that the Ghostabocky Nightmares appear in the Walk of Delusions only until Riku has unlocked the entire bridge.